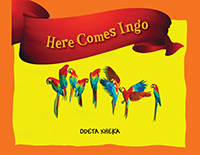 Author Odeta Xheka is taking her latest book Here Comes Ingo, on tour — a Virtual Book Tour with Outskirts Press. This will allow Odeta to take her book into the far corners of the globe, all from the comfort of her own home! Keep an eye out for Odeta’s book as she will be featured on several blogs over the weeks and months ahead! Luckily for us, Odeta was kind enough to answer a few questions as the tour was getting started so that we can give you a sneak peek into the mind of the creator of Here Comes Ingo. OP: Tell us a little bit about Here Comes Ingo. What is it about? Odeta: Here Comes Ingo is the story of Ingo, a scarlet macaw who while nursing her eggs in the hole of a dead canopy tree drifts off to sleep and dreams of flying about into the lush evergreen forest she calls home. Ingo’s dream is a beautiful visual story that exemplifies a progression of thinking leading towards love, kindness and inclusion because the world needs more empathetic, understanding and tolerant children. At first, things may not seem to make much sense. After all, it is not every day that 4-8-year olds get to come face to face with a shark eating cupcakes with gusto or a merry band of birds & frogs piggybacking on a chubby fish or even a solitary wolf improbably wrapped in a rainbow. Yet, page after page of exquisitely crafted compositions encourage children to resist feeling discouraged or scared in front of the unexpected and the unknown. Much like Ingo, they are to rely on their own ability to embrace what at first may seem strange in order to fully enjoy the book. Equally importantly, Ingo’s flying adventures invite children to put their thinking hats on and figure out what the characters are thinking, feeling and doing thus teaching them about setting, structure flow and attention to detail. As with the best of books, at the conclusion of the story, the journey is not over. Ingo invites children to visit again, and again in order to expand on Ingo’s dream world following into the tradition of classic books such as Good Night, Gorilla, The Adventures of Polo, Tuesday, Where’s Walrus, Sea of Dreams and The Red Book. Odeta: I believe that all books for children should offer a truthful depiction of reality all the while promoting a positive worldview. Here Comes Ingo is my honest attempt as an artist and a parent of young children to provide my young readers with a set of creative tools that can serve them in the future to push back against intolerance based on fear of the unknown. At the same time, this book is uniquely crafted to embrace children’s imagination and their innate sense of coloring, wonder and fun as they are invited to expand the story by drawing, coloring and painting on the page. Odeta: This time around, I decided to go the self- publishing route in order to have complete artistic control over the aesthetics of what is for all purposes an art book. I am very happy with the way each paper collage stands out as a unique illustration drenched in superb colors. Odeta: The book has a very clear message, that of open mindedness in front of the unknown- a most timely message. At a time when old and young alike are continuously asked to think of the immigrant, the gender fluid, the poor, “the other” in terms that instill fear and confusion, Here Comes Ingo is the type of book that allocates agency to its young readers. The message is clear albeit a bit more direct and maybe a little less preachy than most books for young children. Let’s just say that as a longtime fan of Maurice Sendak and mother to a very inquisitive 8-year-old. boy and 6-year-old. girl I don’t believe in sugar coating reality. To me, this is another way of approaching children with truth, honesty and authenticity. Real life is not just colorful and happy; life also has darkness. I don’t believe we should coddle children and shelter them from life. With this book, I intend to make it safe for children to face things with their eyes open and to accept that things can be confusing and that not “getting” something at first glance is totally acceptable. They are invited to look harder, probe deeper and make sense of what is in front of them. Odeta: Although Here Comes Ingo is technically a picture book for children, it can easily qualify as an art book. This book is a well-orchestrated visual story that familiarizes children with figurative collage, an ancient art technique. Each illustration is a multilayered collage on paper (made by hand) with special attention paid to the Disney-like palette and the carefully orchestrated arrangement of various animal, insects, birds, grass and trees paper cut outs in order to come up with a final composition that is as Surreal as it is imbued in suggestive possibilities. In other words, each book page collage is “a painting made with scissors” as Henri Matisse famously put it in reference to his paper compositions. Here Comes Ingo‘s artistic language is very inclusive and issues an open invitation to the readers to add to the story and take it as far as their imagination can stretch. Odeta: Yes, years and years ago. It’s a collection of short poems. Although it was written in another land, another language and another cultural & social milieu Bosh Me Te Bardhe (Whitening Emptiness) offers clear parallels with Here Comes Ingo, my most recent book for children. It goes to show that I have always felt a sense of responsibility in tackling “heavy subjects” in order to come up with insightful and honest depictions of reality. Odeta: Most definitely. I am already mapping out (visual) ideas about my next book. I’m at the stage when the giddiness of infinite creative avenues has not yet been dampened by the technical and practical aspects of bringing a book to life so my imagination is going wild. No matter the final direction of this next book, just like Here Comes Ingo, it will extend children the same message of being understanding, tolerant and kind beings. OP: Thanks for your time, Odeta! We look forward to learning more about you as you visit other bloggers! Odeta Xheka is a mother, visual storyteller and fine artist who is busy raising her children and nurturing her art practice. For more information or to contact the author, visit https://www.outskirtspress.com/herecomesingo or Odeta Xheka Visuals.